With a bang or with a whimper? Eastbourne Borough’s unpredictable season lurches to a close this weekend with a tough, but intriguing, game against promotion-chasing Chelmsford City. The Clarets arrive at Priory Lane tomorrow (Saturday) looking to secure third place in the table, and the best possible advantage as they jostle for play-off success. 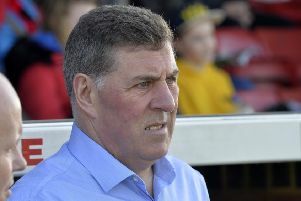 Boss Rod Stringer has enjoyed a much bigger playing budget than his counter-part Jamie Howell, at a club whose finances are one of non-league’s persisting mysteries. Ambitious City have swerved their way through the last few seasons like go-karters through the chicane of old tyres. Creditors come and go, as do plans for a move from the unloved Melbourne Athletics Stadium. There is no denying that Chelmsford are a formidable force. Inconsistency has undermined their hopes of the title – which will be fought out between Havant and Dartford on a dramatic final afternoon – but the Essex side look good for third place. They will travel in numbers tomorrow and Priory Lane should at least see a fine finale. The Sports fell to a 5-2 defeat in Essex in October in a strange contest which saw them take a 2-0 interval lead, before being crushed by a dominant and physically much stronger City side in the second half. Only Gavin McCallum was on the injured list, with a pulled muscle, for the fruitless trip to Hemel Hempstead last Saturday, and the talented attacker will face a fitness test. Otherwise Howell is not short of bodies. Borough have often been easy on the eye, but too easy to beat. “The issues have not changed a lot since earlier in the season,” reflected a rueful Howell this week. “We play with good pace and good energy, and we always look likely to score. But we are undermined in both penalty areas. “Last Saturday at Hemel was not great, and we need to get that one out of our systems. But the previous week at home to Dartford, a neutral observer would hardly have known who were the league leaders and who were mid-table. They had two or three chances and popped one in. We created six or seven, but didn’t get the finish. “Football is won and lost on fine margins. I am the first to admit that this season has been disappointing, but by the same token we are not that far away from a really successful side. The Chelmsford match features a Player of the Year award before kick-off, and further presentations, to which all supporters are warmly invited, in the clubhouse after the game.